How does the electricity market work? Electricity market participant shall mean a person engaged in wholesale trading in electricity. 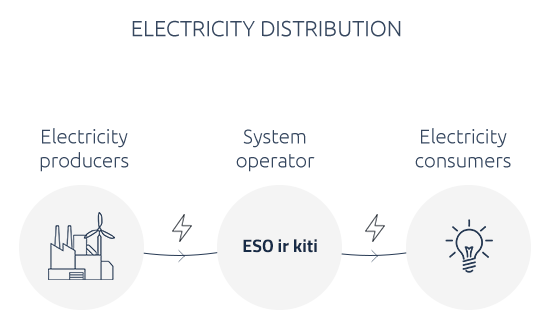 Electricity for consumers usually comprises of two parts – supply and distribution. Electricity supply covers purchase of electricity as a good and distribution – delivery of electricity to the consumers objects and devices, quality of electricity and other related services (excluding balancing services, which are provided by the supplier). Why is it worth to choose independent electricity supplier? If consumer has not chosen indipendent supplier, electricity for him will be sold by the public supplier for guaranteed electricity supply price, which is approved by the National Commision for Energy Control and Prices every year. From 1st of January, 2017 this price is 47,76 EUR/MWh. How to choose independent electricity supplier? If you want to choose independent supplier, firstly you have to contact him and receive an offer. 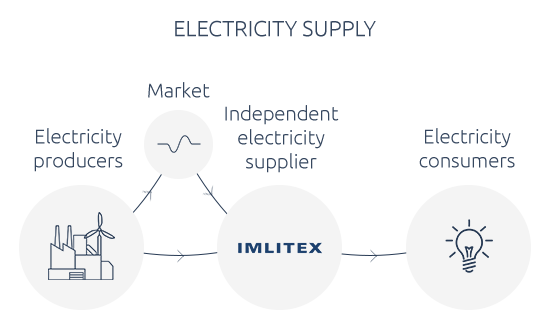 If price and contract conditions are suitable for you, than after signing the contract both parties have to inform grid operator (to which consumer’s objects are connected) about selection of the supplier. It is important to know, that grid operator must be informed no later than 3 weeks prior the agreed start of electricity supply. This start in almost every case has to be the 1st day of a calendar month. For instance, if you want the supply to start from 1st of July, 2017, then the latest day to inform grid’s operator is 9th of June inclusive. Will the declaration of meter reading change if I choose independent supplier? No. You will declare your meter reading in the same order to your grid‘s operator. How can I pay for supplied electricity? Working hours: I-V from 8:00 till 16:45. National Commision for Energy Control and Prices according to the Lithuanian Republic Electricity law article 51 part 9 has made a list of questions and answers for the consumer. You can check it by clicking here.